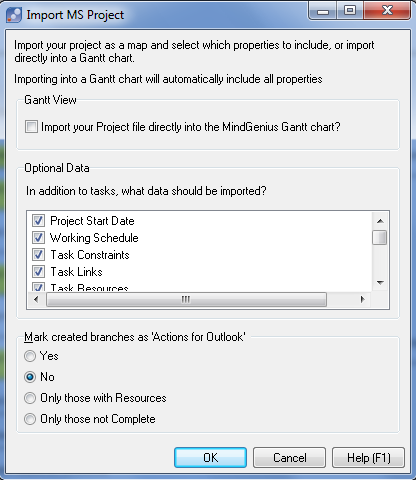 In October's article, I demonstrated how to manage a project using MindGenius’s Resource and Gantt views. 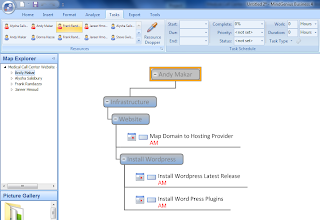 Small projects and individual task lists can be easily managed using a mind map, however, as projects grow in size and complexity, advanced scheduling tools like Microsoft Project are used. Fortunately, MindGenius integrates well with Microsoft Project and helps project managers analyze complex project schedules. 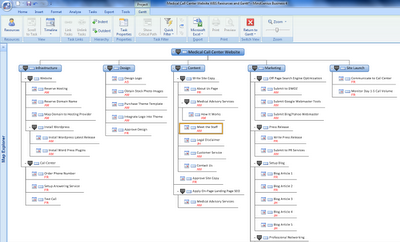 Microsoft Project and MindGenius both produce useful Gantt charts to depict the project timeline. However, when reporting status, it is helpful to provide a project status snapshot using a color coded work break down structure. 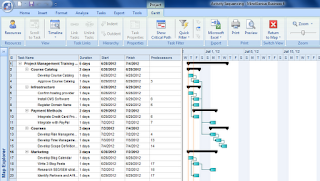 Using a color coded graph to identify late and at risk tasks, provides a quick status at a glance. 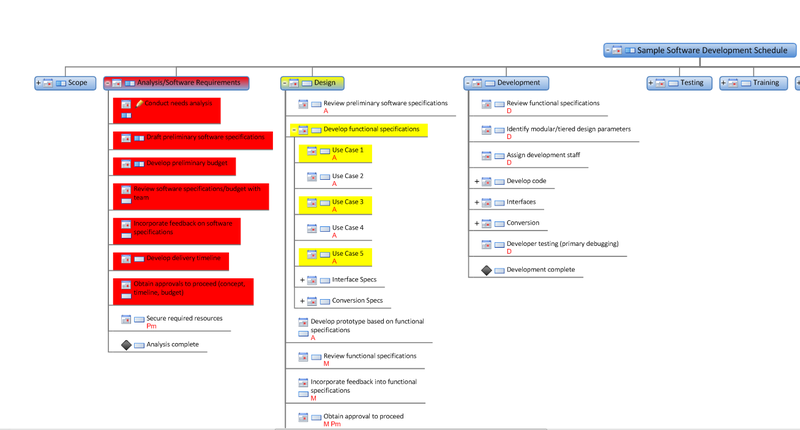 Figure 1 displays the color coded work breakdown structure that identifies late and at risk tasks for a project schedule. 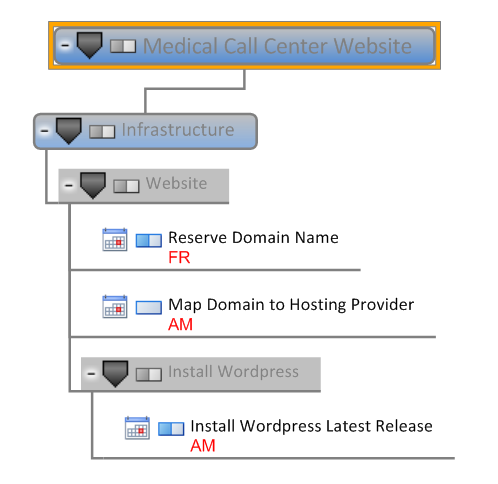 Developing a one page status graphic is easy using MindGenius. The following 6 steps will show you how to import the work breakdown structure, find troubled tasks and correctly color code them based on project status. MindGenius will also create tasks in Outlook however for larger project schedules, I would not import the tasks into Outlook. The import options allow you to select the types of Microsoft Project data that can be imported as well as defaulting the MindGenius Gantt view. 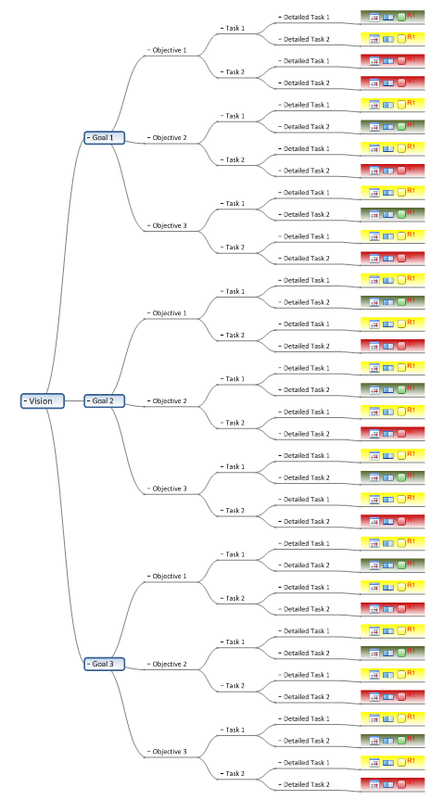 Displaying the Gantt view automatically is a personal preference and for this tutorial, I prefer to use the default mind map view. 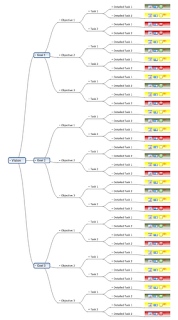 The initial map will be imported as a mind map in the Output Tree – Top down format (Figure 3). 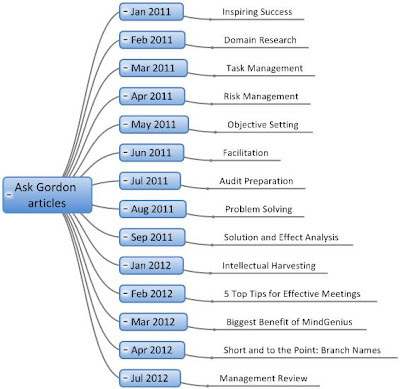 This format is useful for brainstorming but for project managers prefer a graphical work breakdown structure view. 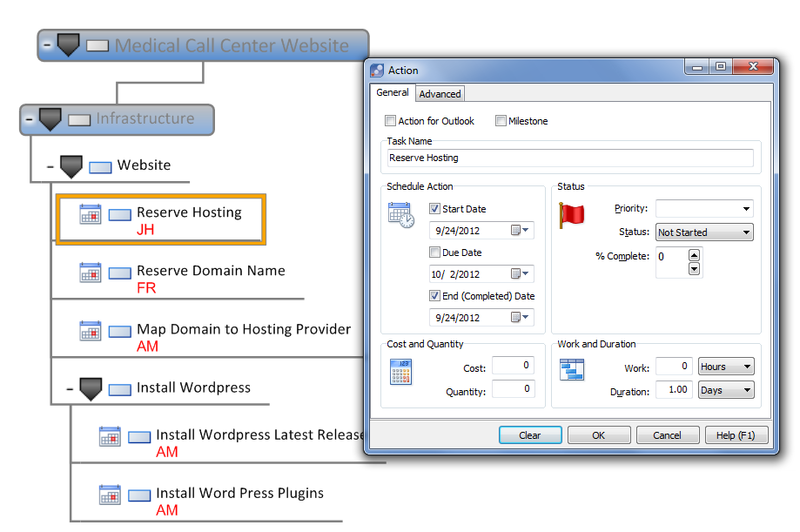 To create a work breakdown structure, click on Map Layouts (Figure 4) and select the Affinity layout. a. 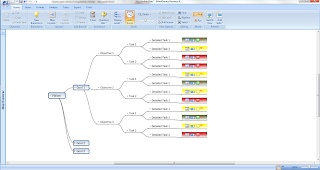 Select Display Levels and select level 1 to collapse all the nodes to top work breakdown structure nodes. Hint: The shortcut key Shift-Ctrl-1 will also quickly collapse or expand the map based on the corresponding number. 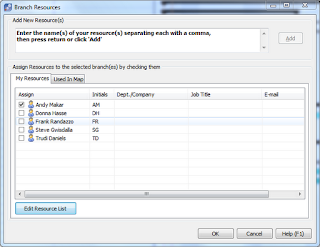 Pressing Shift-Ctrl-2 will expand the work breakdown structure to 2 levels from the root node. For large projects, project managers can use the Map Explorer view to traverse the mind map and focus on relevant nodes and task. This is helpful when examining a specific set of tasks similar to collapsing levels in Microsoft Project. 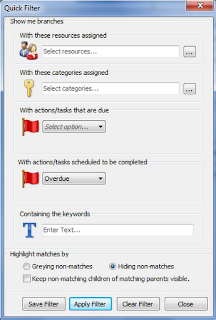 Similar to the previous tutorial, use the task filters to identify any late tasks. 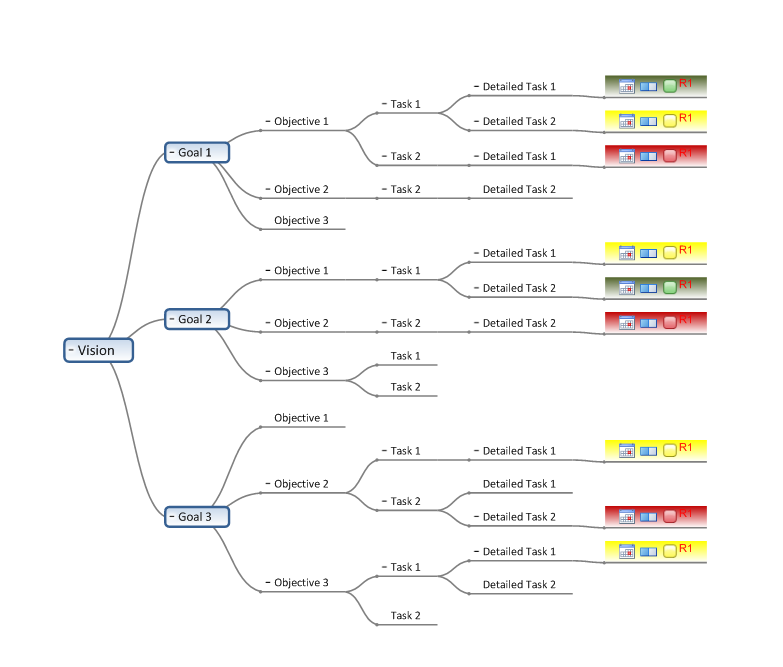 The mind map filter will identify all the tasks that are late and need to be updated. 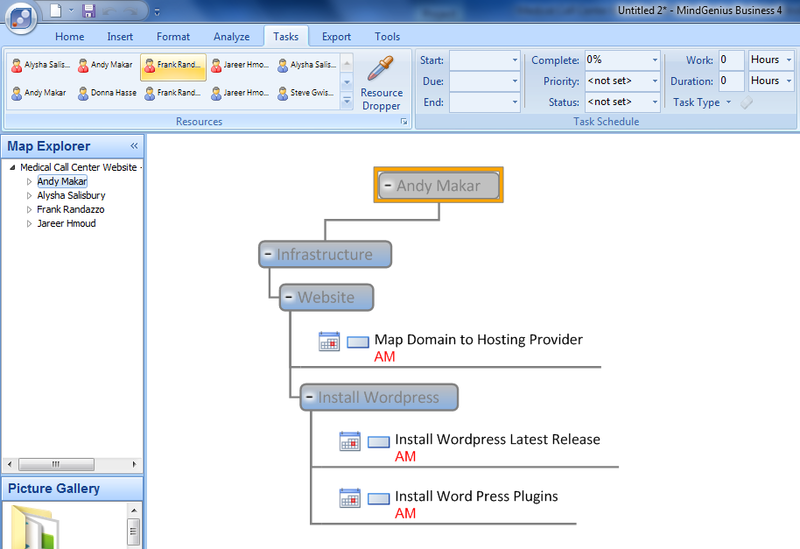 The project manager can also create a Resource Map based on the filter to identify late tasks by resource. Using the filtered map (Figure 7), the project manager can record relevant notes against each task, update the percent complete and adjust the forecasted end date. By clicking on the Pencil icon, the Note Editor will appear and additional meeting notes can be documented against the specific task. Based on the updated mind map, the project manager can update the Microsoft Project schedule using the notes from the meeting. My preference is to update the project schedule manually although project managers could export the mind map and overwrite the Microsoft Project file. I recommend updating the Microsoft Project file manually and use the visual map to facilitate the status meeting and report status. When the mind map is exported to Microsoft Project, it creates Must Start On constraints. As a best practice, project managers should have dynamic project schedules that are free of schedule constraints. Based on the team status meeting, the next step is to color code the late and at risk tasks using the Format – Branch Fill command. 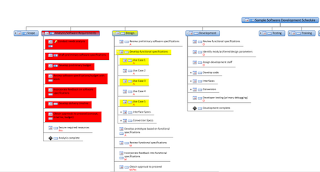 For project status reporting to executive management, I include the color coded work breakdown structure in the status deck before the detailed status report. 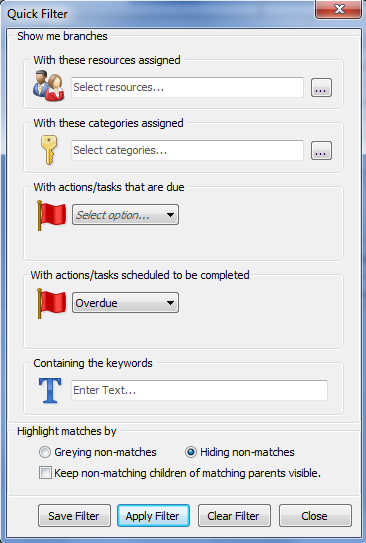 Late tasks are marked red, at risk tasks or tasks that have issues are marked yellow and the rest of the map is left the default color. Project managers may choose to color completed nodes blue or on-track nodes as green based on the amount of data in the map. Once you start working with MindGenius, you’ll appreciate how well MindGenius imports and exports across a variety of file formats. Microsoft Word, Excel, Powerpoint, Microsoft Project, Outlook and even Microsoft Visio formats are supported in addition to images, PDFs, HTML and other mind mapping formats. By importing the Microsoft Project file into a visual format, project managers can communicate status quickly and visually identify problems in the project schedule. Thinking and communicating visually helps improve understanding and delivery. Instead of reading through several pages of a status report, managers can quickly understand the project status visually. Download your free trial of MindGenius today, start importing your Microsoft Project schedule and start managing visually! To download a template with step by step instructions on how to manage your project with MindGenius, visit: http://www.biggerplate.com/mindmaps/bv0dcjuD/manage-a-project-visually-with-mindgenius-and-ms-project. After qualifying in your chosen field it may seem that your mission has been accomplished. But after initial training and qualifications are completed there can be a tendency to sit back and assume that additional experience required will be developed from on the job experience alone. Continuing professional development is important because it ensures you continue to be competent in your profession. It is an on-going process and continues throughout a professional’s career. The ultimate outcome of well-planned continuing professional development is that it safeguards the public, the employer, the professional and the professional’s career. Well-crafted and delivered continuing professional development is important because it delivers benefits to the individual, their profession and the public. Depending on the profession – CPD contributes to improved protection and quality of life, the environment, sustainability, property and the economy. This particularly applies to high risk areas, or specialised practice areas which may be difficult to monitor on a case by case basis. The importance of continuing professional development should not be underestimated – it is a career-long obligation for practicing professionals. In the UK the FSA introduced new regulations for Financial Advisors called the Retail Distribution Review (RDR) on the 31st December 2012. The main aim of RDR is to ensure that the Financial Services industry returns to being a consulting and advisory service, based on fees rather than commission, and the regulators hope it will improve the reputation of financial advice and advisors. A dramatic impact on the industry is predicted and casualties expected. How is your implementation of RDR going? Whenever a new way of working is introduced it can be difficult to find the time to work on what’s required and implement the required changes when you have current projects to work on. With new legislation to decipher, further qualifications required, and new policies or ways of working to put into practice, it can feel like an uphill battle to keep on top of things and this seems to be the case for many people and businesses implementing RDR. Ad+, a team of chartered accountants and business consultants who are one of only 41 practices to be included in “The UK’s best accountancy services” used MindGenius mind mapping software to help them plan and prepare for RDR, and also see MindGenius as a solution for post RDR life. Matt Donnelly, Managing Director and Founding Partner strongly believes that better client engagement, through effective questioning and listening techniques, is the only way to drive the sales process and ensure identification of opportunities for both the clients and for businesses, especially in the post RDR landscape. Matt believes the Fact Find stage of the process (fact find, research, advice and opportunities) needs to be transformed into an engaging Discovery style session that really gets to the heart of what clients are looking for in life, exploring things such as retirement plans, how they would like to look after their family members and charitable contributions as well as the hard facts of the client’s current situation. MindGenius have put together a short video on a Discovery style session. You can view it here. This process is generally based on a template approach that balances the hard and soft fact finding process to find out; where we are, where we want to be and how we will get there. For the session to be a success it must engage clients in the process; effective facilitation and management when using the map template can ensure the session is interactive and keeps the client visually engaged. This results in a financial plan where the client understands how the plan works and the advisor is clear on the opportunities it presents. Whether RDR is relevant to you or not, this discovery approach is worth introducing to your client engagement. 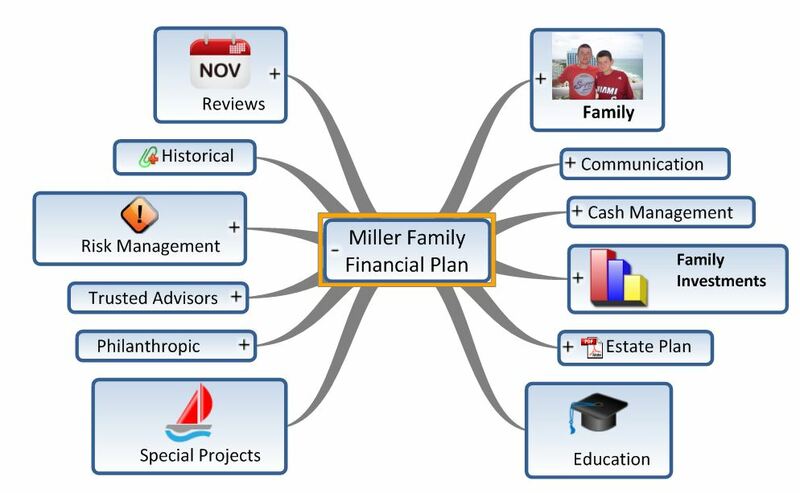 Mind Maps are basically tree diagrams that can take on a variety of forms. After World War 2, Japan used Tree charts (called Hoshin Plans) as a top down management planning tool to create, drive and implement the biggest quality revolution the world has ever seen. 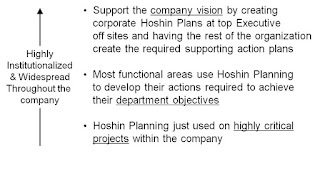 Hoshin Plans, which are Mind Maps, were elevated in Japan to one of the 7 most important Management Tools. They were used for annual strategic planning for entire companies and at lower levels for department level strategic planning and individual project management, tracking and execution. That detailed level of planning was seldom seen in the western world at the time and it is still considered to be a best practice method of planning today. 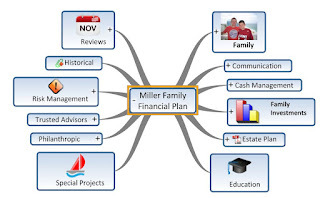 Mind Mapping software offers very user-friendly and rapid creation and modification of the Plans, which was one of the original barriers that blocked its widespread acceptance in the western world. This article will give the basics on Hoshin Planning and show they can be created with MindGenius Mind Mapping software. The Hoshin Plan is often considered to be too detailed, difficult to create or use. It was often difficult and time consuming to construct and modify these Plans in popular software tools such as Excel and PowerPoint. I will make the bold statement that if user-friendly software like MindGenius was available when Hoshin Planning was first discovered in the West, the widespread use of this Planning tool might have been more popular. I say this because this powerful and effective Plan is extremely easy and fast to create and edit with MindGenius. Japanese-style Employee Empowerment is also a widely misunderstood concept outside of Japan. Too often, it is thought that employee empowerment can replace top management planning, direction and vision setting. However, empowered activities must be in line with management's top level Vision, Goals and Objectives, not replace them to avoid uncoordinated chaos. Not every company can afford to pursue Six Sigma quality levels targeting only 3.4 defects per million products produced. Big problems can arise when the void of management vision and direction is filled in with the vision of quasi-empowered employees who invent their own agenda for the company, which is not coordinated with other employees nor management. 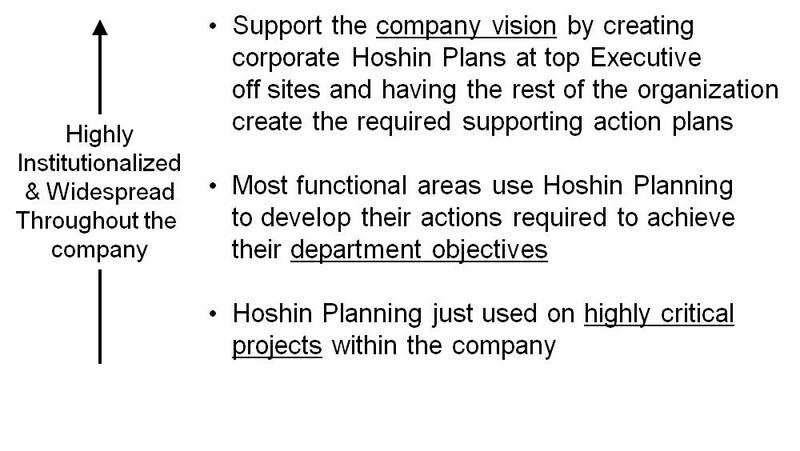 A Hoshin Plan should incorporate 5 levels of detailed work breakdown structure as shown below. At the detailed task level, personal task assignments, due dates and red, yellow and green color codes for the status are recommended for a good Hoshin plan. Note that the words "full set" is used often in the above list. In a good Hoshin Plan, each term to the right of the Vision should include a full set of exhaustive intentions and activities required to support the term to the upper left of it. 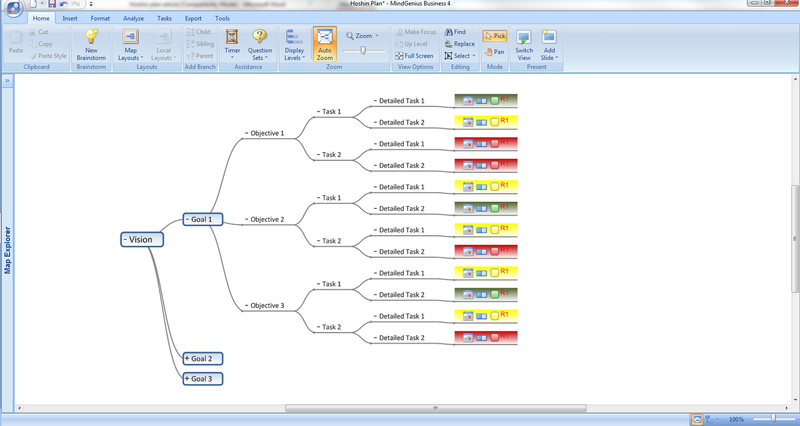 What follows is a template for a 5-level Hoshin Plan created in MindGenius software with 5 levels, with added information in the far right branch for responsible resource, detailed task completion rate, start and completion dates and visual color codes for the detailed task status (red, yellow or green). 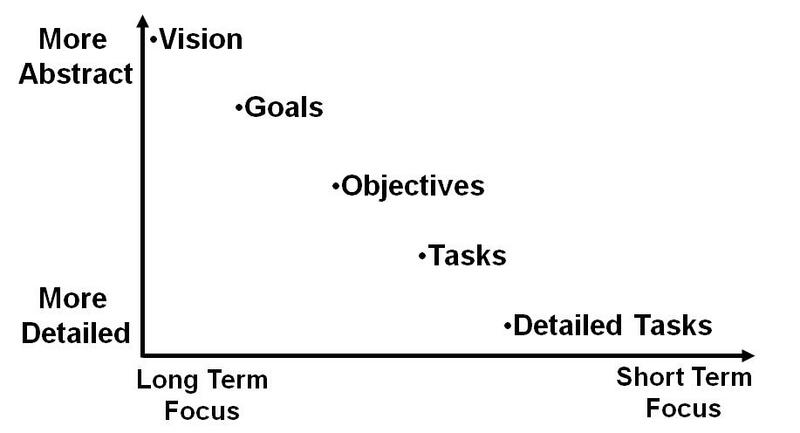 This example is partially visualized, only showing the details for Goal 1. Red denotes that the plan is behind schedule. Green means that it is on schedule. David Patrishkoff is President of E3 Extreme Enterprise Efficiency® LLC. He has held various worldwide senior executive positions in the past and has trained 3,000+ professionals, worldwide from over 55 different industries in Lean, Six Sigma and other advanced problem solving techniques. He is a proven business turnaround specialist who resolves “Mission Impossible” situations for organizations on a regular basis. Visit his website for training, coaching and consulting services: www.eeefficiency.com. MindGenius, the leading business mapping software developer and Connect Distribution are delighted to announce their partnership which allows them to offer localized help and support in CEE. 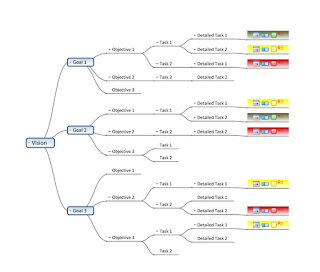 MindGenius has been producing mind mapping software for business and education since 2001 that allows users to capture, visualize and manage their information. MindGenius is the only mind mapping software tool that focuses on aiding key business processes and allows organisations to specifically delivers business value in activities such as project planning, brainstorming, strategic planning, task management and information mapping. Connect Distribution Sp. z o.o., a company founded in 1998, is a specialized distributor of IT solutions with added value who deliver highest quality, world class software solutions backed up with consulting and technical support, for both the Polish and Eastern European markets. Derek Jack, Director, MindGenius said: “By partnering with Connect Distribution we have the opportunity to introduce MindGenius into the territory knowing we have solid local support, experience and knowledge there. MindGenius is one of the most cost effective software tools for delivering productivity improvements in business and we look forward to working with Connect Distribution to introduce it to their customers." Find our more about MindGenius at www.mindgenius.com. If you study PMI’s Project Management Body of Knowledge (PMBOK), you’ll find every project management process is supported by a variety of tools and techniques. Unless the project management office prescribes a specific tool, the project manager typically selects the best tool to manage the project. For project schedule management, the project manager may use Microsoft Project, sticky notes and index cards or visual management tools. Project managers can choose from a never ending supply of software tools, however, it is important to understand the best tool for the job. Large projects may use complex scheduling tools and smaller projects can benefit from a simple task list. The best tools are adaptable and can support small or large projects without overwhelming the project manager. MindGenius provides a flexible and creative approach to managing a project entirely within MindGenius or integrating with Microsoft Project. In my previous blog post, I shared how to use MindGenius to create a project schedule starting from brainstorming ideas to structuring a formal WBS and building a reliable project schedule. Depending on the size of the project, project managers may export the project into Microsoft Project and refine it or they can manage the project within MindGenius itself. 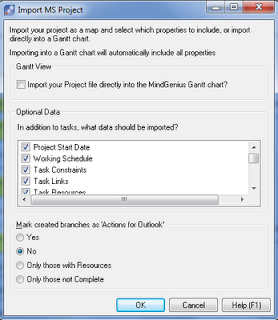 This article provides an overview on how you can manage a small project using MindGenius resource maps and Gantt chart views. 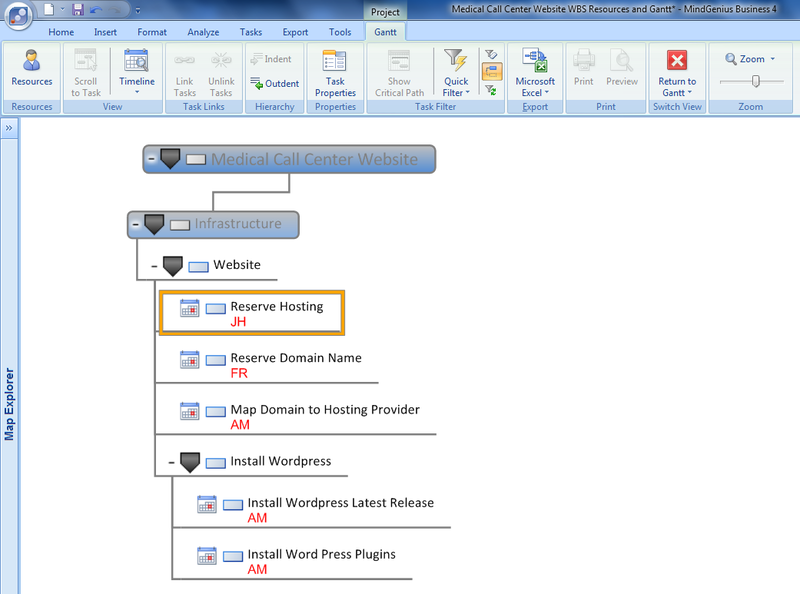 Figure 1 displays a sample work breakdown structure for a website development project. The project schedule had been developed using the 6 Steps from Scope to Schedule tutorial. MindGenius provides two key views and filters to manage this project using either the Resource Map or the Gantt view to update the project schedule. Prior to a status meeting, it is useful to identify all the tasks that need to be updated for the time period. It is also useful to organize the tasks by resource so the project manager can quickly obtain updates easily. 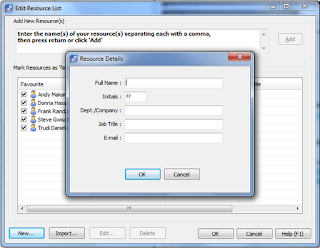 Using the following steps, the project manager can filter and organize the work breakdown structure for easy updating. 5. 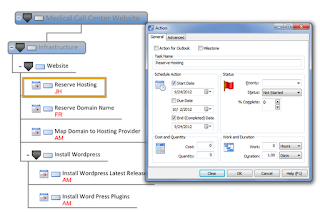 Double Click on a specific task to open the Action dialogue box and enter a percent complete. 6. Repeat for each of the remaining tasks. The project manager can adjust the start date and completion date based on the team member feedback. Based on the new project dates, the map will filter the relevant tasks based on the filtered criteria. In larger maps, it is common to have many tasks due within a given time period. 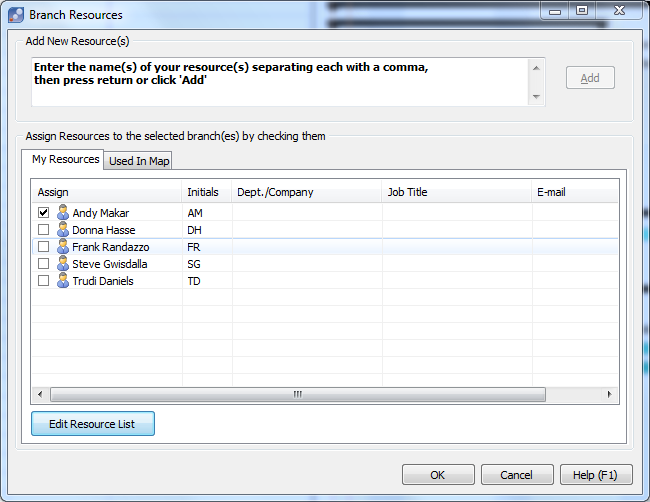 By using the Resource map, the project manager can quickly organize the tasks by assigned resource. This often makes it easier to obtain updates as each team member can provide progress updates. 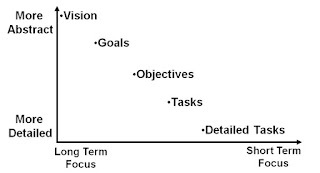 Figure 6 identifies all the tasks that are due and assigned to the selected resource. By clicking on each resource’s name in the Map Explorer, the project manager can quickly update all the overdue tasks assigned to each specific resource. Prior to the project status meeting, the project manager can create these different views and distribute them to the project team for quick updating. 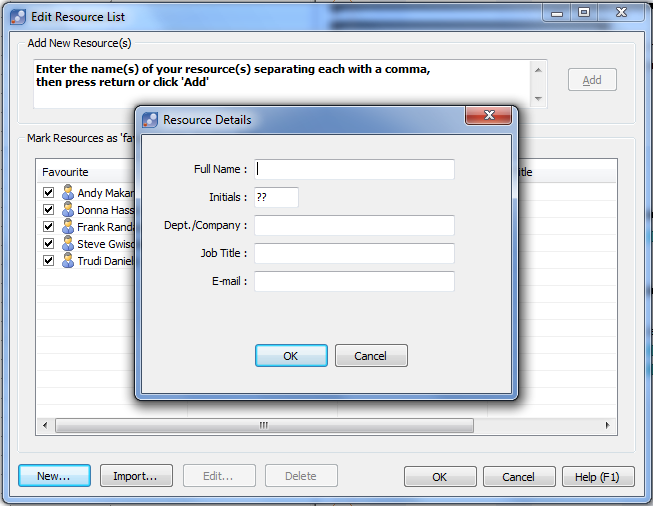 The project manager can also display the complete resource map and navigate by each assigned resource. The visual nature of the map helps project teams focus the immediate tasks and additional notes can be easily added to the map. The second option is to use the traditional Gantt view to manage the project schedule, update tasks and view the direct impacts against the project timeline. 3. Apply the Completion Overdue filter by selecting the Quick Filter option (Figure 7). The grey bars and tasks are disabled in the Gantt chart view as they don’t meet the selected Quick Filter criteria. Project managers can adjust the various filters to identify completed tasks, late tasks and tasks missing assigned resources. The quick filters help to visually identify concerns within the project schedule while maintaining the complete schedule within the project context. 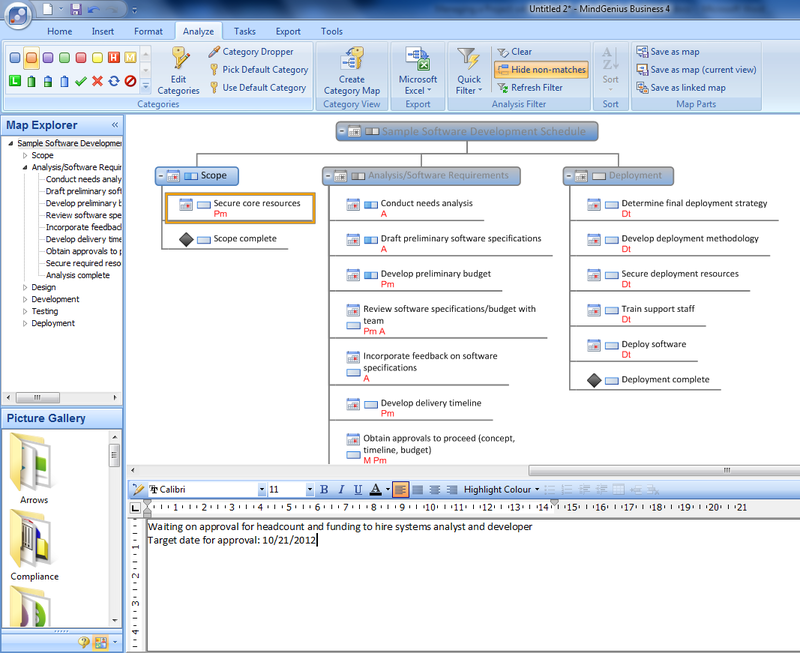 The project manager can click on any of the tasks and provide task updates similar to Figure 4 in the previous technique. Any changes to the project schedule will be reflected in the Gantt chart. If the project manager wants to switch back to the mind map view, all of the updates in the Gantt chart view will appear in the graphical mind map view. MindGenius provides useful views across the core set of project data, supports visual planning and provides traditional project management views to effectively manage a project. Thinking visually helps project teams communicate better and understand complex topics including detailed project schedules. These visual techniques are just one approach to managing a project within MindGenius. 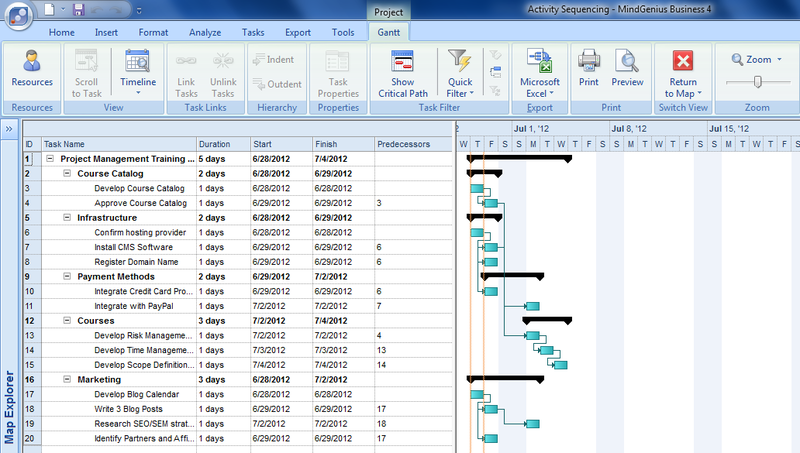 In the next tutorial, I’ll show you how to manage the project schedule by integrating with Microsoft Project. If you’re not a MindGenius customer yet, download the free trial and follow along with these project management techniques. Biggerplate, one of the largest communities of mind map users in the world, are hosting a series of “Biggerplate Unplugged” events with the aim to inform and inspire the mind mapping community, and provide a focal point for individuals and organisations to meet and discuss developments and innovation within the mind mapping world. MindGenius will be represented at the London event by Jim Mather, Chairman of sister company Gael Ltd. Jim served as a Member of the Scottish Parliament from 2003 until 2011. In 2007, he was appointed Minister for Enterprise, Energy & Tourism: a role he served until he stepped down from front line politics last year. During Jim’s Keynote session, he will aim to discuss the question: “Is there justification for giving mind mapping software mainstream status?” Jim believes that mind mapping software has the ability to help to keep people purposefully connected and make tangible progress and we must now talk up those, who, internally or with external alliances, have used such systems to simultaneously be more competitive and more collaborative in order to make the message more widely known. Jim will also share his experience of using this approach in Government. The London event will be held on Thursday, January 31, 2013 from 10:00 AM to 6:00 PM (GMT) at the Hub Westminster, SW1Y 4TE, and will offer the opportunity to bring together mind mapping software users, developers, bloggers and trainers to explore trends and innovations in the world of mind mapping and will include Keynote sessions, expert speakers, and roundtable discussions. Check out the MindGenius groups on Biggerplate: http://www.biggerplate.com/groups/mindgenius. You will find Resources for Project Managers, Financial Planners and those in HR as well as general business and personal maps. In these tough economic times, MindGenius is committed to being a cost effective mind mapping software solution for businesses, individuals and those in education. Our pricing model remains perpetual which means there are no costly monthly subscription fees. Our list price is highly competitive, particularly given the amount of business focused functionality in MindGenius. For information on pricing visit our website. 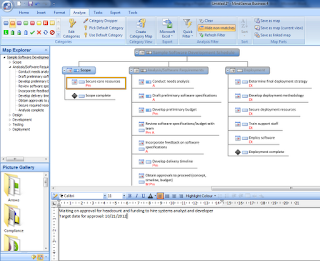 MindGenius can also import other mind mapping files meaning you can easily use maps created in other tools* in MindGenius. The 30 day free trial is fully functional and no credit card is required to access the download. Download a 30 day free trial now. MindGenius Ltd and E3 Extreme Enterprise Efficiency are pleased to announce a strategic partnership between their two companies. E3 is a worldwide business training and consulting firm founded in 2001. They are based in Florida, USA. E3 has helped companies in over 55 different industries worldwide to solve their most serious problems through management and employee training, coaching and empowering highly focused teams. E3 specializes in adding fun and smiles to business improvement efforts, which can dramatically increase the engagement levels of employees. This technique is also known as Gamification. E3 incorporates Six Sigma, Lean and their own Enterprise-Wide Change-Management techniques to help transform ordinary organizations to the extraordinary. Their specialty is the high speed resolution of high profile, "Mission Impossible" million dollar-plus issues, without laying off employees. The purpose of this partnership is to integrate the advantages of MindGenius software in E3's new Business Transformation War Games™ (aka: BT War Games) Change-Management methodology, which drives enterprise-wide efficiency, innovation and productivity improvements. 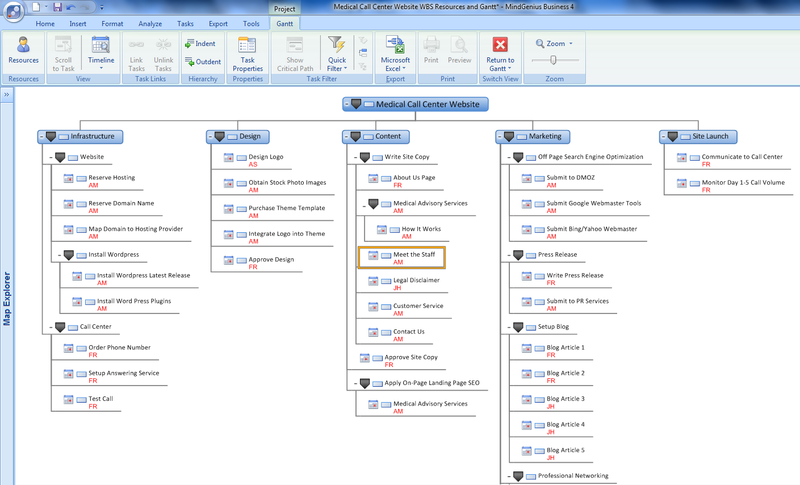 E3 chose MindGenius software for its user-friendliness, unique ability to enhance group brainstorming events, flexibility, integrate graphics, hyperlinks, assessment scores and key project metrics into Mind Maps. BT War Games integrates Gamification techniques in business improvement efforts to couple serious business improvement efforts with fun and smiles. This has been proven to help create paradigm shifts, expose taboo-talk rules and diplomatically expose deeply imbedded cultural inefficiencies. 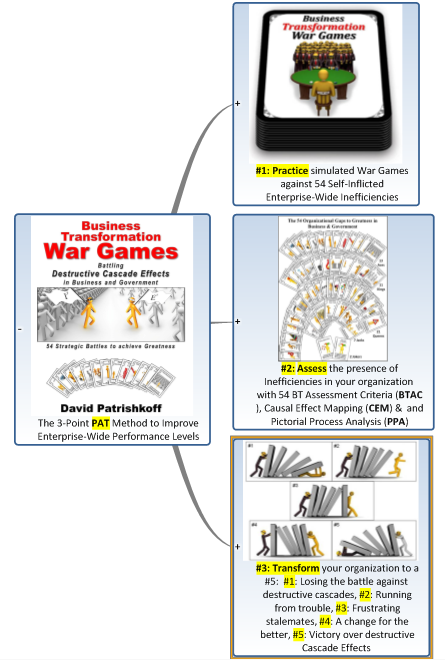 BT War Games drives organizational culture change aimed at addressing undisciplined MBAs (Management Behaviors and Attitudes), inefficient work habits and everything in-between. E3 mapped out the entire required transformation journey for organizations using MindGenius Software. All of the required efforts to prepare, practice, plan and actually implement an entire organizational transformation has been mapped out and documented on mind map templates. After training in BT War Game Techniques, clients can use the templates to drive enterprise improvement for an entire business or one department or key business process at a time. 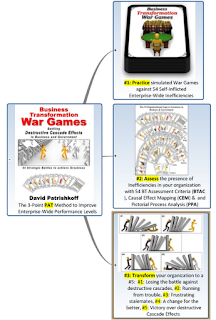 E3's Business Transformation War Games™ uses a unique deck of cards in many ways. These cards highlight the 54 organizational flaws that keep repeating themselves throughout history. David Patrishkoff, President of E3, discovered and categorized these 54 inefficiencies during his multi-year research. These 54 flaws can be sorted into 5 major elements of Cascade effects, which are called Aces, Kings, Queens, Jacks and Jokers based on their destructive power within an organization (See illustration below). These 5 elements of Cascade Effects Analysis seeks to identify the work environment, cultural and management behaviors and attitudes, which contribute to business issues. When the rank, number and intensity level of the 54 inefficiencies in business and government reaches a certain critical mass, they create destructive Cascade Effects that can explain all major business and government failures and disasters, past present and future. E3 uses Cascade Effect Analysis to supplement advanced root cause analysis techniques like correlation and regression analysis. 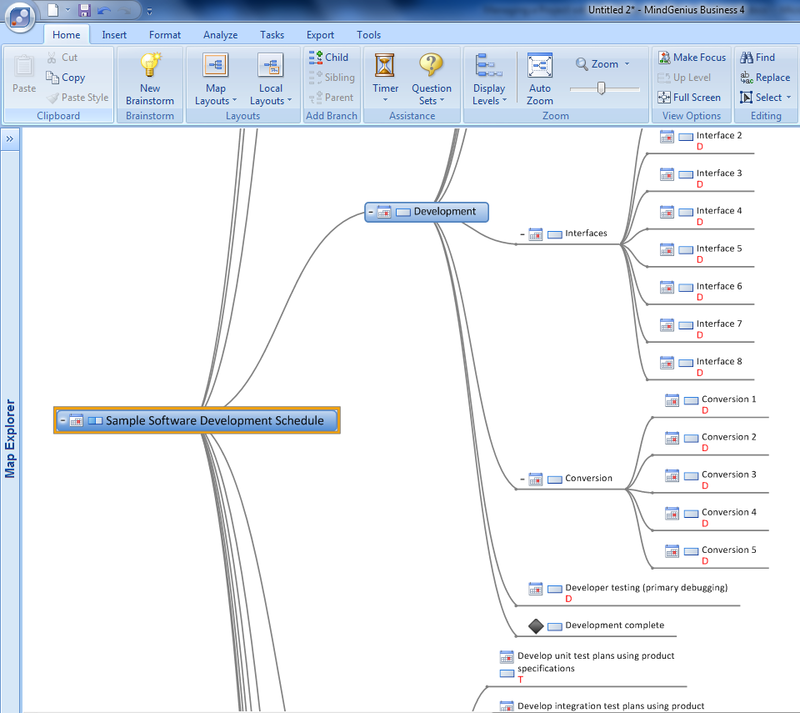 Some examples of how E3 is using MindGenius software to create Mind Maps are shown below. 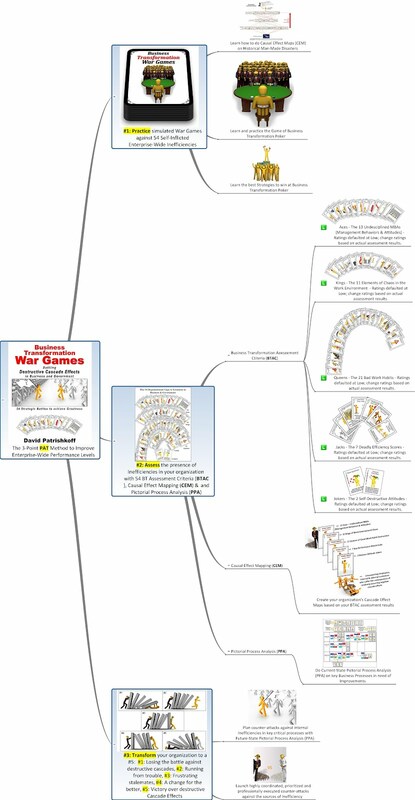 This first illustration shows the top level 3-point BT War Games methodology, which is mapped out at several branch levels in the software. The next illustration shows just some of the many branches on the E3 Mind Maps, which incorporates illustrations, assessment scores, action plans, scheduling and resource details and much more. The auto-formatting mode of the MindGenius software allows E3 to focus on the required details and planning of the work to be done and not worry about formatting issues, which could take up large amounts of time for complex projects. "E3 is very pleased to have partnered with MindGenius. The partnership allows us to expand our dedication to high quality and enlightening graphical displays, brainstorming techniques and the resolution of complicated problems with the use of science, information analysis, data analysis and user-friendly software. This effort helps us to draw fast and accurate conclusions for our clients and solve their most difficult problems with the least amount of effort. MindGenius truly helps us to work smarter and not harder." E3’s most popular consulting and training services are based on Lean Manufacturing, Lean Office, Kaizen event facilitation, Lean Six Sigma and Design for Six Sigma and advanced innovation techniques. Visit the E3 website at www.eeefficiency.com to read more on their doing-it-right the first time consulting, training, problem solving and total company optimization services. For the last two month’s MindGenius have been running free online Skills Workshops for all of our maintenance paying customers. The webinar sessions offer free training on MindGenius on a variety of topics and the opportunity to ask our Product Expert any questions you may have and are designed to ensure you continue to get value from your investment in our products and services. September’s session takes place on the 26th at 4pm, GMT, 11am EDT and is on Brainstorming with MindGenius, looking specifically at mapping techniques to aid brainstorming, and using the inbuilt MindGenius Brainstorm mode. This will enable brainstorming to become an effective, every day technique in your organisation. The sessions will be hosted by Jamie MacDonald, Head of Client Development, a highly experienced trainer, facilitator and coach who has over 20 years experience in training, development and business improvement. The sessions last for no more than an hour. Maintenance paying customers can register now by contacting us at webinar@mindgenius.com. If you have any ideas on topics you would like to see us cover in the Skills workshops, let us know in the comments below. New MindGenius Partner Continuing Professional Development, are offering a 20% discount on MindGenius Mind Mapping Software when you register and purchase one of their online courses. Vivian Kloosterman, CPD, said: “Our own experience with MindGenius Mind Mapping Software shows that it is particularly relevant to many of our courses and we are happy to offer this discount to enable our customers to experience the benefits of MindGenius for themselves." Visit their site now to find out more on this special offer.